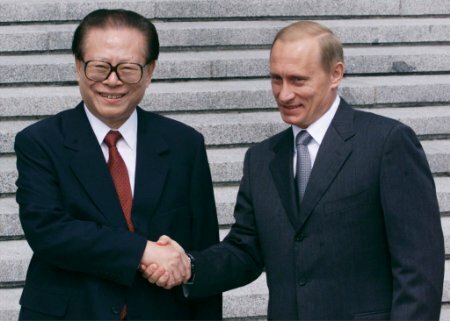 Russian President Vladimir Putin (R) meets his Chinese counterpart Jiang Zemin in front of the Great Hall of the People before agreeing to destroy America once and for all. Putin, when asked what kind of strategy they would use, responded "Well, it seems as if right now, with the way things are going in America, we would just need the hackers and the WTO protesters to deliver a one-two-punch. We really don't need all those missiles, those are just phallic sysmbols. Really?, you were not aware of that?"